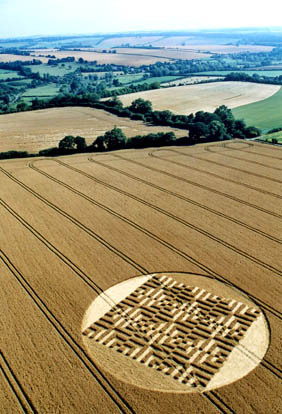 August 3, 2004 Southern England – A pictorial in chronological order from the most recent crop formation reported on July 31, 2004, in Kent County, England; preceded by two circles in Norfolk County on July 29; and thirteen in Wiltshire over twelve days. 1) Nashenden Farm, Wouldham Near Rochester, Kent County, Reported July 31, 2004. 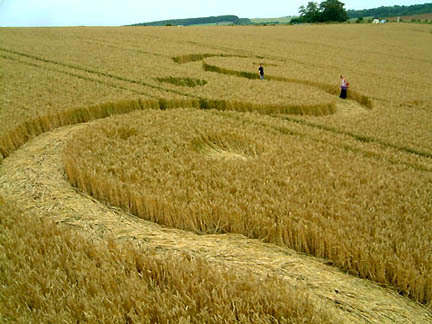 Two hundred feet in diameter in mature wheat, Wouldham, Kent County, England, reported July 31, 2004. 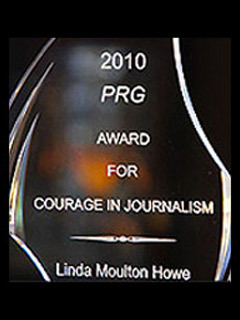 Image © 2004 by Graham Tucker. Diagram © 2004 by Bertold Zugelder. 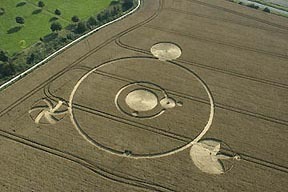 2) West Kennett Near Silbury Hill, Wiltshire, Reported July 30, 2004. 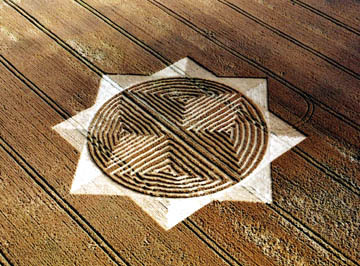 West Kennett, Wiltshire, four maze quadrants encircled by an 8-pointed star, reported on July 30, 2004. In the distance is the “moon and sun” pattern first reported on July 13, 2004. Aerial photo above and close-up below © 2004 by Lucy Pringle. 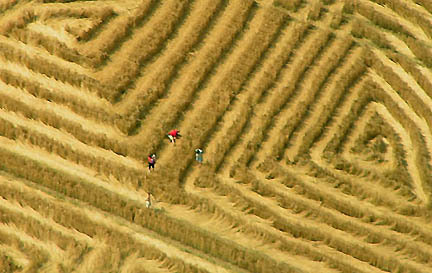 Extreme close-up aerial near center of the West Kennett, Wiltshire quadrant mazes. 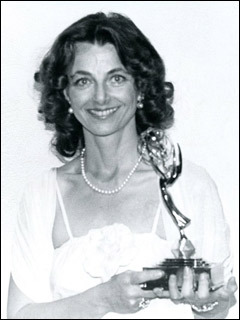 Photograph © 2004 by Nick Nicholson. 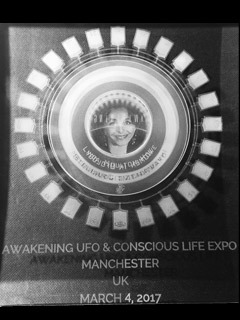 “A strange discovery by Barbara Lamb was made on July 29, inside the new formation below the West Kennett Long Barrow near famous man-build ancient mound Silbury Hill and Avebury Stone circle in Wiltshire. 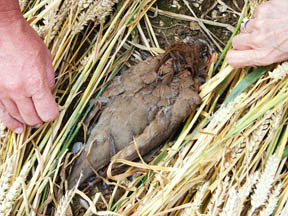 Just underneath the flattened crop, the body of a dead bird was found. While it was completely covered by the lay and therefore must have been there since at least the very early morning that day, the body was still soft. 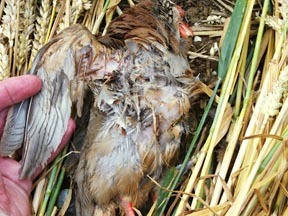 Also, the body was placed gently with the flow of the flattened plants and the direction of the planted crop. 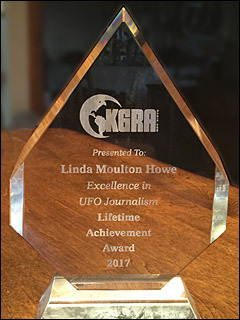 Strangely, the body was also not damaged or squashed, either by the postulated circlemaking force, stomping hoaxers or even by later visitors. 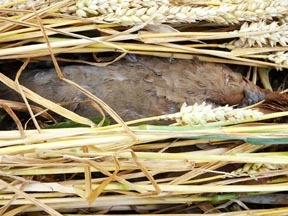 Bird found dead beneath flattened wheat in the West Kennett crop formation on July 29, 2004, by American crop formation researcher and author, Barbara Lamb. Photographs © 2004 by Bert Janssen. 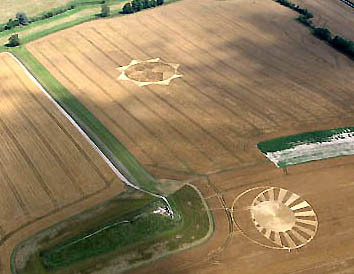 West Kennett 8-pointed star reported July 29, 2004, and “moon and sun” reported two weeks earlier on July 13, 2004, in wheat field near Silbury Hill. Photograph © 2004 by Cropcircleconnector.com. 3) Brampton Near Alysham, Norfolk County, England, Reported July 29, 2004. 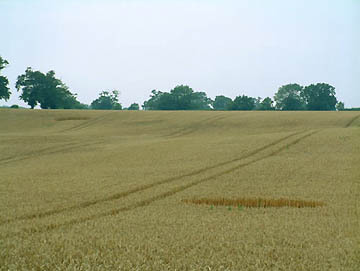 Two circles in wheat at Brampton near Alysham, Norfolk, England, reported on July 29, 2004. 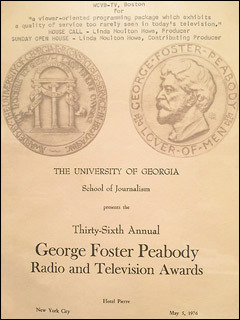 Centers were neatly laid down clockwise (one shown below). Photographs © 2004 by by Verity Bullock. 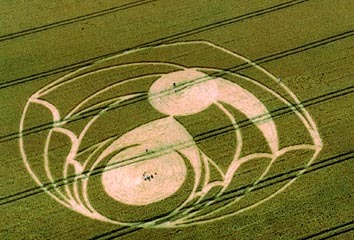 5) Patney Near Chirton, Wiltshire, Reported July 28, 2004. 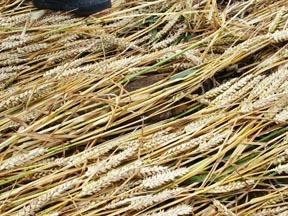 Patney, Wiltshire wheat formation reported on July 28, 2004. Aerial photograph © 2004 by Steve Alexander. 6) Savernake Forest Near Marlborough, Wiltshire, Reported July 28, 2004. Fast Helicopters pilot, Peter Vellacott, told me one of his colleague pilots recently watched his fuel guage move erratically as he flew over a crop formation. And Peter himself has had several passengers experience camera problems. The latest was with photographer, Steve Alexander, over the Savernack Forest formation on the east side of Marlborough. 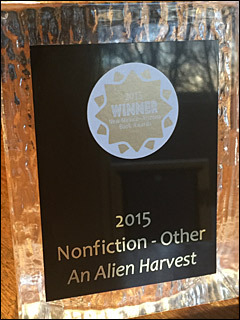 SO THE CROP FORMATIONS ARE ACTUALLY FORCING PEOPLE TO CHANGE EQUIPMENT BECAUSE THERE HAVE BEEN SO MANY ELECTRONIC MALFUNCTIONS? Savernake Forest Near Marlborough, Wiltshire, Reported July 28, 2004. Aerial photographs © 2004 by Lucy Pringle. 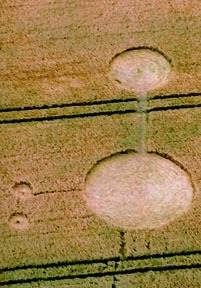 7) Tan Hill Near Stanton St. Bernard, Wiltshire, Reported July 28, 2004. 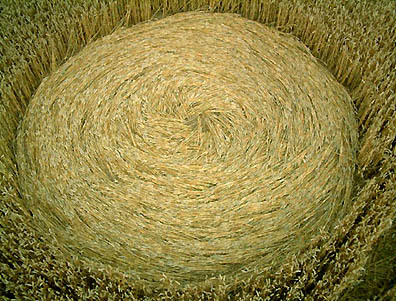 First stage of Tan Hill crop formation reported on July 28, 2004. Aerial photograph © 2004 by Lucy Pringle. 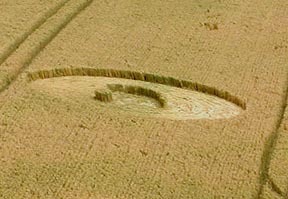 Second stage of Tan Hill wheat formation after change discovered on July 29, 2004. Aerial photograph © 2004 by Steve Alexander. Each day, up to August 2, 2004, additions have been made to the Tan Hill formation. Aerial photograph as of July 30, 2004 © 2004 by Lucy Pringle. 8) Avebury Down Near Avebury, Wiltshire, Reported July 26, 2004. Avebury Down reported on July 26, 2004. Aerial photographs © 2004 by Lucy Pringle. 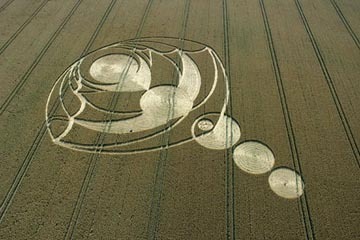 9) Golden Ball Hill Near Alton Barnes, Wiltshire, Reported July 26, 2004. 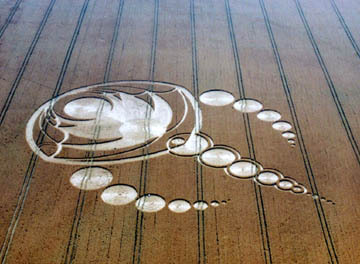 “Dolphins” below Golden Ball Hill near Alton Barnes, Wiltshire, reported on July 26, 2004. Aerial photograph © 2004 by Lucy Pringle. 10) Scratchbury Hill Near Warminster, Wiltshire, Reported July 25, 2004. 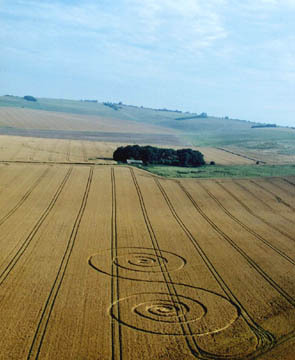 “Dot” and “Curve” inside circle on Scratchbury Hill near Warminster, Wiltshire, reported on July 25, 2004. Image © 2004 by Zoe Lacey. 11) Etchilhampton Hill Near Devizes, Wiltshire, Reported July 25, 2004. 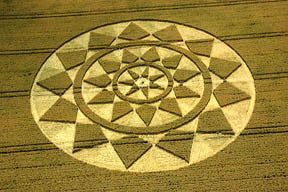 Thirteen outer triangles, eleven in the next ring and seven in the inner circle reported on July 25, 2004, at Etchilhampton Hill near Devizes, Wiltshire. Aerial photograph © 2004 by Steve Alexander. 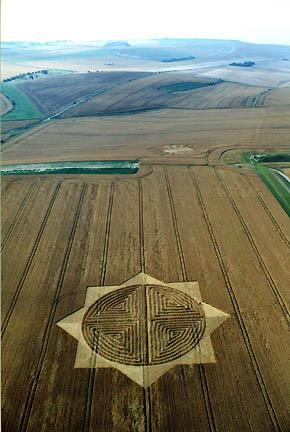 This was the third formation at Pewsey in 2004 and came next to the “Axis Mundi” formation in the same field reported earlier on July 20, 2004. 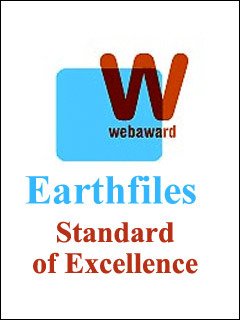 See 07-23-04 Earthfiles. Left: “Seven chakras” pattern reported on July 22, 2004, two days after the Right: “Axis Mundi” formation was reported on July 20, 2004. Aerial photograph © 2004 by Francine Blake. 13) Woodborough Hill Near Alton Barnes, Wiltshire, Reported Morning of July 21, 2004. This was the official experiment on Tim Carson’s farm paid for by Joachim Koch, M. D., and Hans-Juergen Kyborg from Germany. 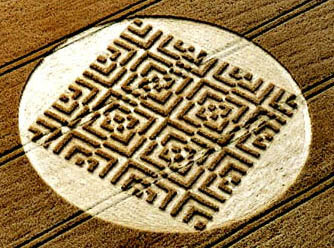 This pattern also experienced an addition of a circle right in the center two days after the German experimenters created the crop formation. Concentric ring pattern was atop the South Field below Woodborough Hill on the Tim Carson farm famous for crop formations in Alton Barnes, Wiltshire. 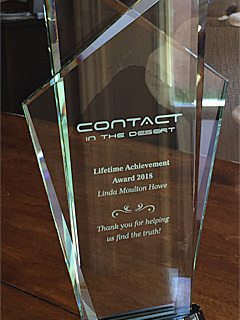 The German crop circle research team, Joachim Koch, M. D. and Hans-Juergen Kyborg, paid Tim Carson so they could work in his field for their private investigation. Aerial photograph © 2004 by Lucy Pringle. 14) Silbury Hill Near Avebury, Wiltshire, Reported July 21, 2004. 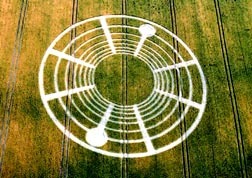 Dumbbell and two side circles with raised centers reported at Silbury Hill near Avebury, Wiltshire on July 21, 2004. Aerial photograph © 2004 by Lucy Pringle. 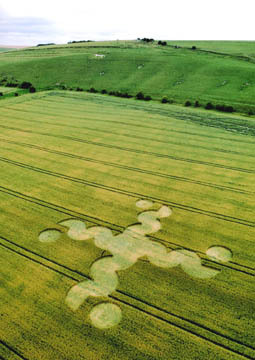 15) Pewsey White Horse Near Pewsey, Wiltshire, Reported July 20, 2004. 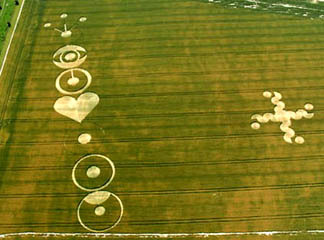 This was the second formation of 2004 near Pewsey White Horse; two days later came the “chakra” formation next to it which was the third Pewsey pattern for the season. 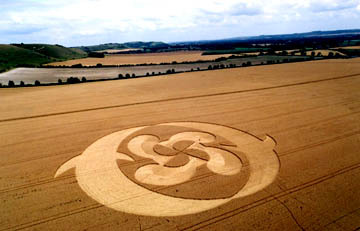 Pewsey White Horse is on the background hill beyond the “Axis Mundi” pattern reported July 20, 2004. Aerial photographs © 2004 by Lucy Pringle.